Lime Street had a world wide reputation for "ladies of the night", with one name particularly associated with that trade, but as the opening lines of the chorus of the famous song "Maggie May" tell us … "she’ll never walk down Lime Street anymore". 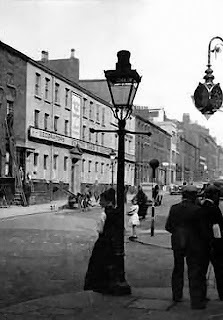 "Prostitution was rife in the 1800s, especially during the so called 'naughty nineties', when Maggie and her contemporaries offered their services to seaman, and others, on Lime Street and in the public houses which lined that famous thoroughfare. "Maggie herself is alleged to have plied her trade in the American Bar. 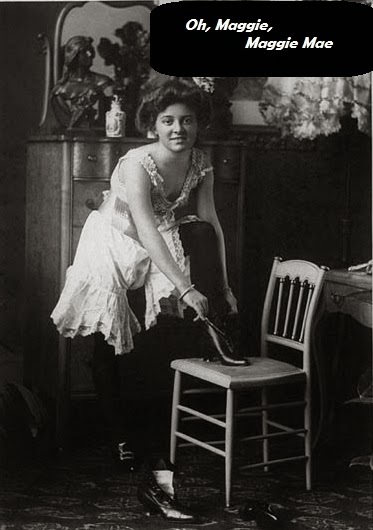 Some other famous "ladies" associated with that period are Mary Ellen, the "Battleship", Jumping Jenny and Cast Iron Kitty, although how and why they acquired those names is not clear. "When you see films with regards to prostitution, you get the impression it was a tremendous problem. Well that didn’t apply to Liverpool. The poor girls in Liverpool were just poor girls. In my day, a lot of them were just married women who were just bloody hard up." The song was "A foc'sle song of Liverpool origin apparently, but immensely popular among seamen all over the world..."
Hughie Jones of the Spinners Folk Group recalls his memories of Maggie May……. "My first job was as an office boy in Duke Street and I’d heard the rumour that Maggie May lived at number 17. One day somebody came in and said a funeral has just gone by and it was Maggie May and that was in 1952. I thought that can’t be true because I’ve always known the song; there’s two versions". It seems that the landsmen sing the dirty version and the sailors sang the clean version. Sailors were very puritanical in that way because they reserved their dirty songs, and there were hundreds of them, for on board ship. When ashore, they wouldn’t sing their working songs, their shanties, they would sing what they call forebitters, which are songs they sang for their own amusement. There is a clue in the song as to when Maggie May was born. So I found out what an able seaman’s pay was, when it was four pounds ten. That gave me an idea of the date. So was she still alive in the 50s? It is possible. Maggie May had many contemporaries of course. One was called Jumping Jenny and the famous one was The Battleship, pretty ominous really. The Author Lyn Andrews borrows the name in her book 'Maggie May' which recounts the tale of a young girl made to suffer by her cruel father Nago May who, disappointed and disgusted that his wife has given birth to a girl instead of the boy he wanted insists she be called "just plane Maggie". Liverpool's own 'Lovehistory Tours' offer to take you back to the days of Maggie May with their 'Love Real Ale' tour. "This maritime themed event will not disappoint. Back in it’s hey day, Liverpool was a famous seafaring port and the buzz and energy of young sailors filled our town. As new worlds opened up, so did new possibilities and sailors propelled the cultural revolution of the early twentieth century. Through their travels to faraway lands, sailors would return with new forms of art, music, dance, fashion as well as compelling tales from foreign shores. “To really get to the beating heart of Liverpool you have to visit its pubs. There you will find what defines its identity, its history and most of all it’s people” The Great Liverpool Pub Crawl"